The singer's show-stopping live performance wowed millions - before the lights in the Superdome went out for half an hour. Beyonce Knowles put on a spectacular half-time song-and-dance routine at America's Super Bowl - a week after she admitted miming to a backing track during President Obama's inauguration. Dressed all in black, the singer strutted around the stage electrifying 73,000 fans in the stadium and more than 100 million television viewers. 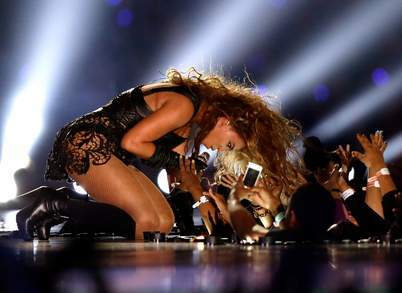 Accompanied by a swarm of background dancers she sang a range of her high-octane hits, including Single Ladies and Crazy In Love, during the 13-minute set. 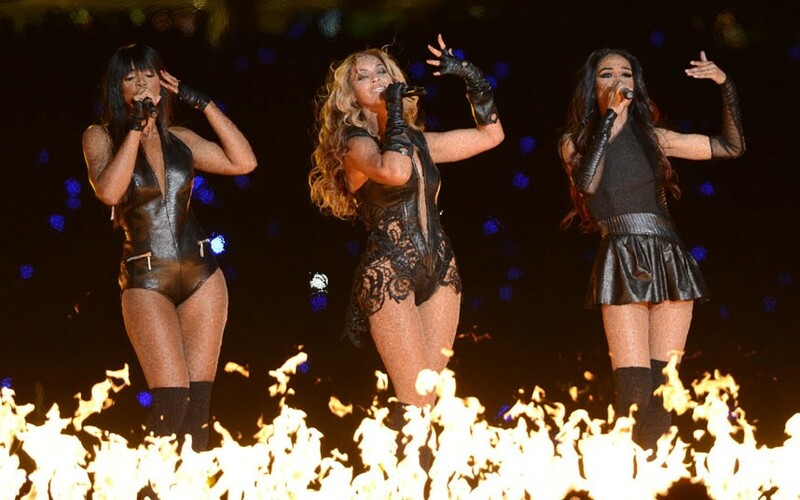 She was also joined by her Destiny's Child bandmates Kelly Rowland and Michelle Williams for the track Bootylicious. At a pre-game press conference on Thursday, the 31-year-old stated she would be "absolutely singing live," adding: "I always sing live". But as play resumed after Beyonce's show, a power cut threw New Orleans' Superdome into near-darkness for over half an hour. The scoreboard and half of the overhead lights went out. Officials waved a stop to play, which abruptly short-circuited the most-watched television event of the year. The lights first went out on the San Francisco 49ers' side of the field before dimming in other parts, while overhead lighting remained on and kept the 72,968-seat stadium from being plunged into total darkness. "Those things happen, and both teams had to deal with it," said Baltimore quarterback Joe Flacco, who was named Most Valuable Player. His team, the Ravens, eventually managed a 34-31 victory over the 49ers. Beyonce's star turn at the game was followed by the announcement that she would be embarking on a world tour, including six dates in the UK, in April and May 2013. The tour is seen as the US singer's big comeback after giving birth to her daughter, Blue Ivy Carter, in January last year. Before the game, Alicia Keys also performed a version of the national anthem that her publicist assured was live. The Grammy-winning singer played the piano as she sang The Star Spangled Banner in a long red dress with her eyes shut. Keys followed Jennifer Hudson, who sang America The Beautiful with the 26-member Sandy Hook Elementary School chorus. It was an emotional performance that had some players on the sideline on the verge of tears. Beyonce performs a half-time spectacular the Superdome. The school children wore green ribbons on their shirts in honour of the 20 children and six adults who were killed in the shooting at the Connecticut school in December. Hudson's mother, brother and seven-year-old nephew were murdered five years ago.